Day 2 had us waking up early to head outside of Bangkok to visit some markets and a fishing village. I had done a lot of research on tour companies and decided on Tours with Tong (www.tourwithtong.com) based on the recommendations of others and their pricing. 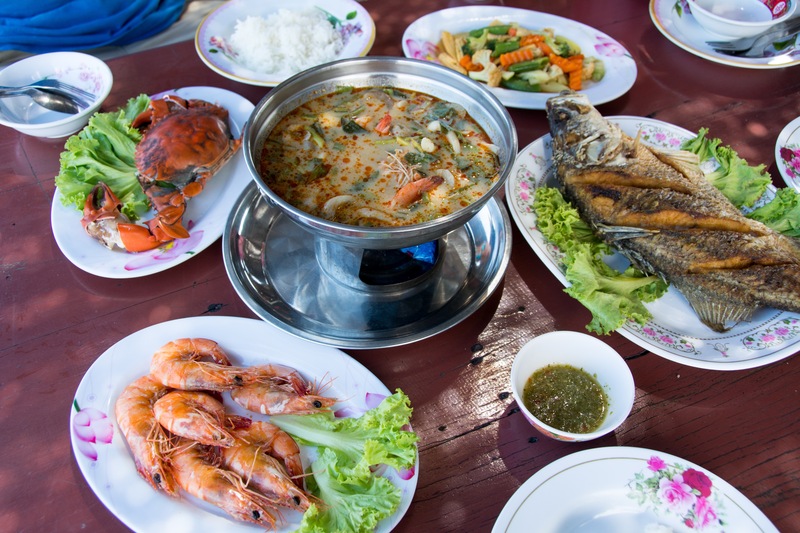 Our tour for the day included a private guide, transportation, gas, toll fees, boat fee at the floating market, boat trip at the fishing village, seafood lunch, and fruits for the monkeys (there were no hidden fees). Our first stop of the day was to the railway market, located about an hour outside of Bangkok. What is a railway market you might ask? Well it’s exactly like it sounds, a market that is setup next to the tracks of the train. Amazingly enough, they put their wares at a level that is just below the train, and the stalls all have easily retractable awnings. As you are walking through the market you are literally walking on the train tracks! The market is about 0.20 miles long and there are are so many vendors lined up along the train tracks selling a variety of goods, but mostly food stuffs as far as we could tell. Per our tour guide, the train runs through the market 8 times a day, and as soon as the locals hear the train is coming, they tell all the tourists to move to the sides. They do not want any incidents. We weren’t really sure what to expect and were wondering how far back we really needed to move in order to stay a safe distance away. Here everyone is “patiently” waiting for the train to come through. While we were waiting, I was just snapping pictures and was able to capture this adorable moment between a grandmother and her granddaughter. Still one of my favorite pictures of our entire trip. While we were waiting, all the vendors started pulling in their awnings (you can see all the awnings tucked away in the photo below) and making sure all the people get off the tracks. Well with the exception of this woman crossing the tracks with the train close at hand. Luckily, the train really moves very slowly, it is definitely not an express! After the train passes by, all of the awnings come back down and it’s business as usual. It really is no big deal at all to the locals. After the train departed, we picked up some fruits and vegetables for the monkeys of the fishing village. This vendor was helping us cut up our purchases. 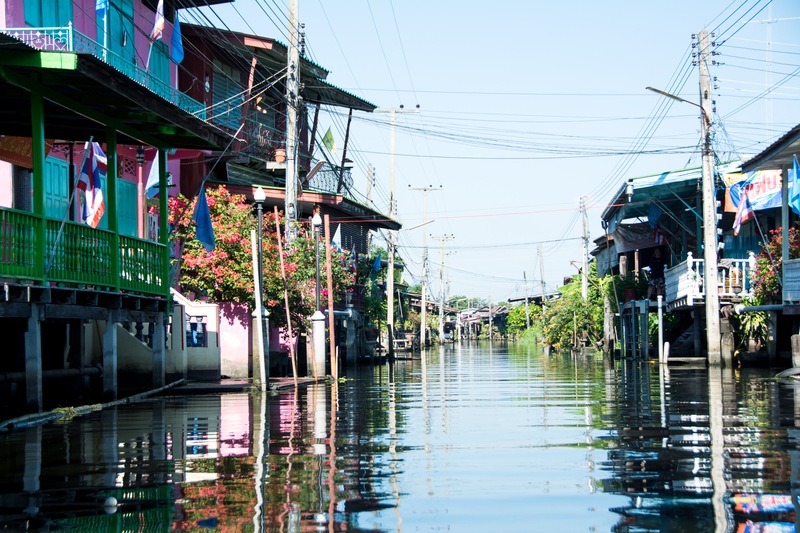 There are a few floating markets near Bangkok, however Damnoen Saduak Floating Market is the largest and most well known. 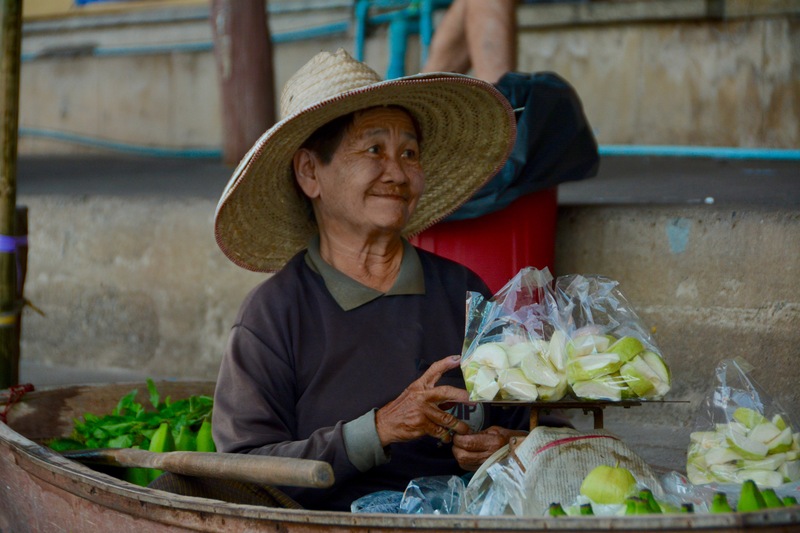 As a result of its popularity, it is also the most “touristy” of the floating markets. As you can see from the photo, the boats take up the entire canal and are filled with tourists and vendors. Since our tour included the boat service, I didn’t get a chance to see how much it was if you hired your own boat, but this is where everyone loads onto the longboats. Immediately you will see all sorts of vendors on the banks of the canal and also in boats floating along with the rest of us. Vendors sell fresh fruits and vegetables, ice cream, prepared foods, and lots of souvenirs. At the floating market, if you want to buy something you just motion and the vendor will pull you over with a long stick and then when you have finished your purchase or finished browsing, you’re off again. I highly recommend stopping by this vendor to get some mango and sticky rice! And some coconut ice cream too! I know we did…YUM! The few times we did stop to inquire on prices of souvenirs, they were charging exorbitant amounts. I tried to negotiate, but the prices really didn’t go down enough. I would recommend that you shop around after you get out of the boat and take a look at the shops around the market. Many of the vendors sell the same or similar items and we were able to find items for much cheaper once we got off of the boat. So as you start off on your boat ride you might see this guy with the python. Our boat came very close to him as the canal area by him was super crowded and he scared me to death! He and Scott both thought it was hilarious…I’m sooooo not a snake person. Once you get out of the busy market area, the boat will take you around the area canals and you will see some homes. It’s much more peaceful outside of the market. It was very cool navigating around the canals, but very different atmosphere than riding in a gondola in Venice. We did do a little shopping after our boat ride. My advice is to negotiate heavily (at least 50% off of what they ask). Don’t be shy, their initial offers are almost always ridiculously overpriced. We were able to get a few things at what I thought was a great price. As we were leaving the market, we ran across this little guy….I guess he is happy to have his own “air conditioned” suite (don’t worry, he is the owner’s pet and NOT on the menu!). The next stop on our tour was to a local fishing village. Before we got into our boat, we stopped at a local home/restaurant and picked up our food and drinks. We were then taken to this restaurant in the middle of the bay. When they told us that we were having lunch, I imagined a couple dishes, but look at this spread! The seafood was really fresh and delicious. After lunch we went by some Oyster farms. 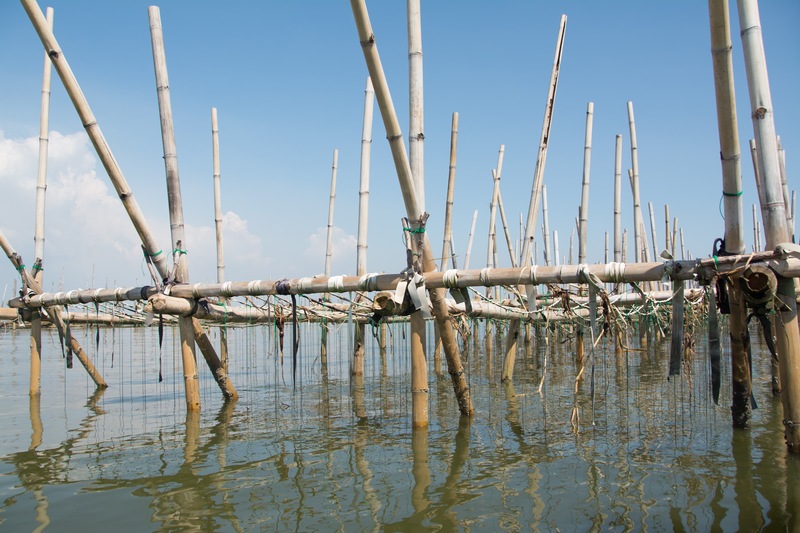 They are bamboo poles that have been tied together and then oysters are tied to strings and left there until they grow to the right size. There were tons of these bamboo formations. 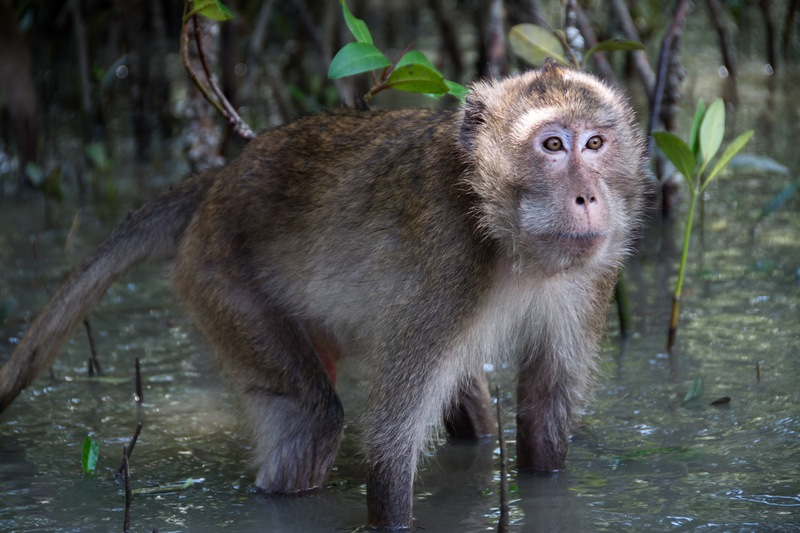 The main reason we signed up for the visit to the fishing village was because we wanted to meet the monkeys who lived in the mangroves near the village. As I mentioned before, we had stopped at the railway market for some snacks for the monkeys (bananas and a root vegetable). When we got to the mangroves, the boat driver and and the guide started calling the monkeys and soon you could hear them coming. Before you knew it, there were monkeys lining the banks. So as soon as we started tossing out the goodies, the monkeys were super excited. 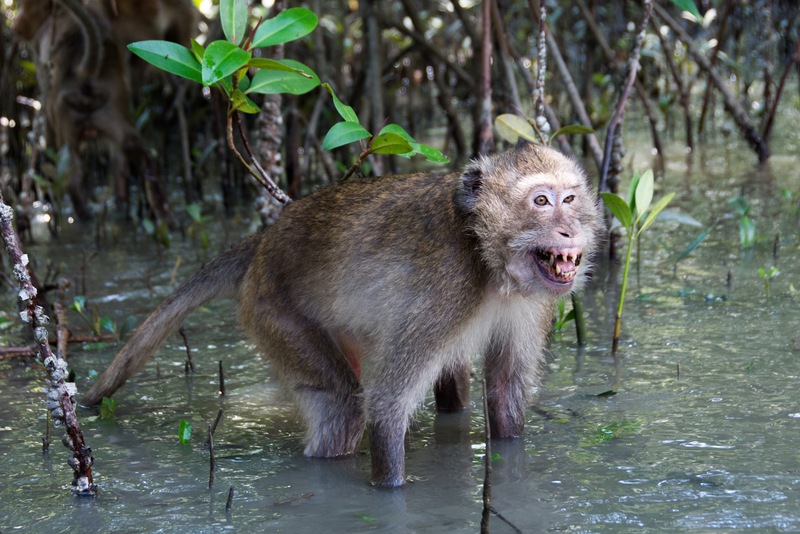 However, we apparently weren’t throwing fast enough, because this same monkey was pretty angry when another monkey snatched a banana away from him….this is when I started wondering if this was a great idea. Not all the monkeys were so intense. You can see this mama and her baby in the trees waiting for us to toss something to her. So some of the monkeys are quite a bit more brave. 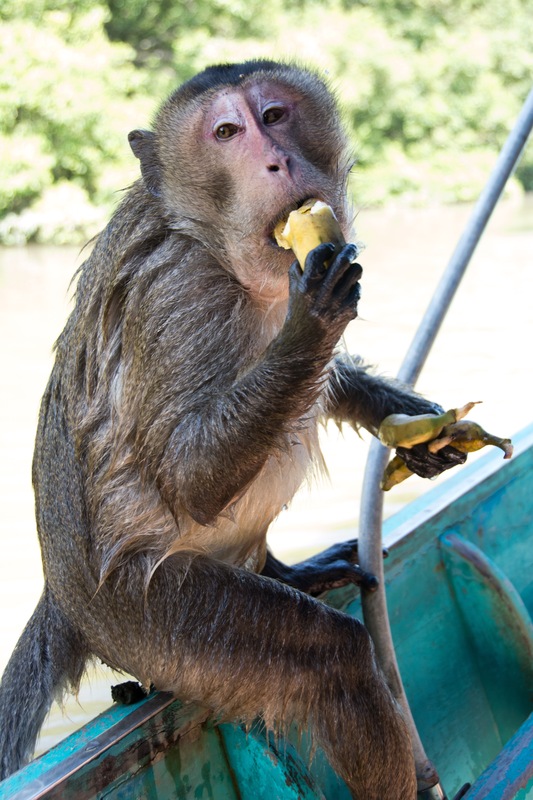 This little guy decided he was going to sit on the boat and double fist some bananas. Overall the lunch was awesome, and the monkeys were interesting. I wouldn’t recommend it for the faint of heart as they can get rather aggressive. We definitely had one monkey who tried to take the entire bag of bananas, luckily he was easily appeased with a bunch of bananas. 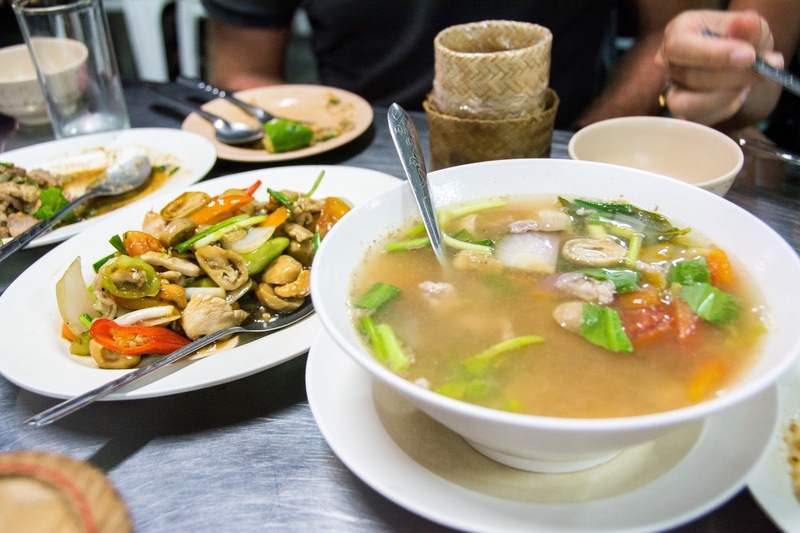 Trying new foods is one of my favorite parts of traveling and since Scott and I both love Thai food so much, we figured we had to check out the food scene with a local and maybe get out of our comfort zone. I mean I love green curry and pad thai as much as the next person, but I’m sure I have a thing or two to learn about Thai food. After a bit of rest at the hotel, we got ready for our Midnight Food Tour. No the tour does not start at midnight, it actually started at 7 PM. We took the MRT and met the group at SamYan, there were 2 guides and they presented us with the menu for the night. As soon as everyone arrived, we were put into a tuk tuk (2 people per vehicle) and we were on our way. 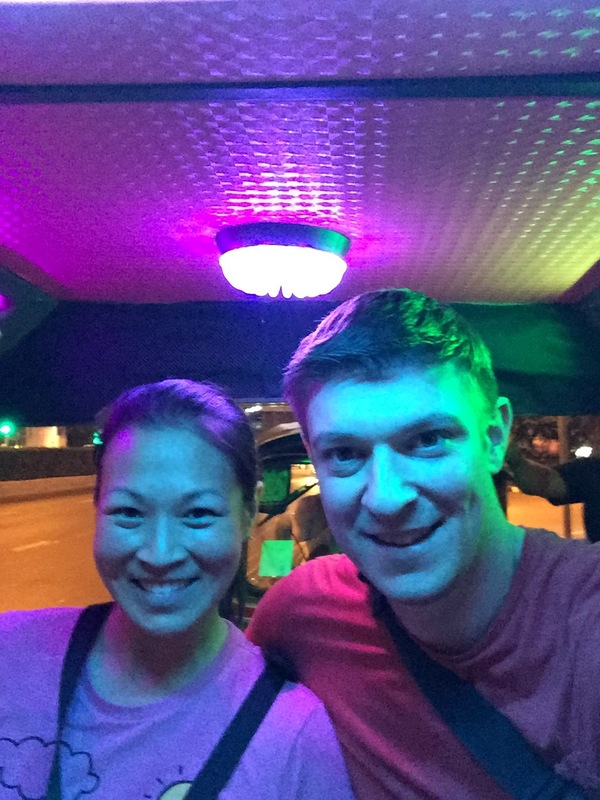 It was really fun having our own private tuk tuk, our driver had even decked his tuk tuk out with neon lights,a tv and some serious speakers! I’m not going to give you all the places that we went, so that you can enjoy the food tour yourself. But I will show you a few of the delicious noms we got to try. This dish is prepared in a wok over charcoal. All the chefs cook outside because of the charcoal. There are 2 varieties you can try – Roast Chicken with Ham Squid and Noodle and Roast Chicken with Egg and Noodle. We opted for the regular Chicken. You also get the choice of either a scrambled egg or an over easy egg. We asked for one of each so we could try. We ended up loving the one with over easy egg as the yolk coated the noodles and chicken and really makes the dish that much more luscious. I highly recommend trying this dish. As we watched some of the other people in our tour group jump for the chance to snack o these little guys. It took us a little longer to muster up the courage to give it a try. Here you can see us trying a grasshopper and a bamboo worm. EEEEK! So the restaurant we went to was Thip Samai (313 Mahachai Road, Old City) which has been open for over 50 years. When you arrive, you will see the long queue, but don’t worry it moves fast. Our guides told us that this restaurant became famous because of an article that was written about it by a British tourist who wrote about how the pad thai there was amazing and thus started the restaurant on its path to fame. 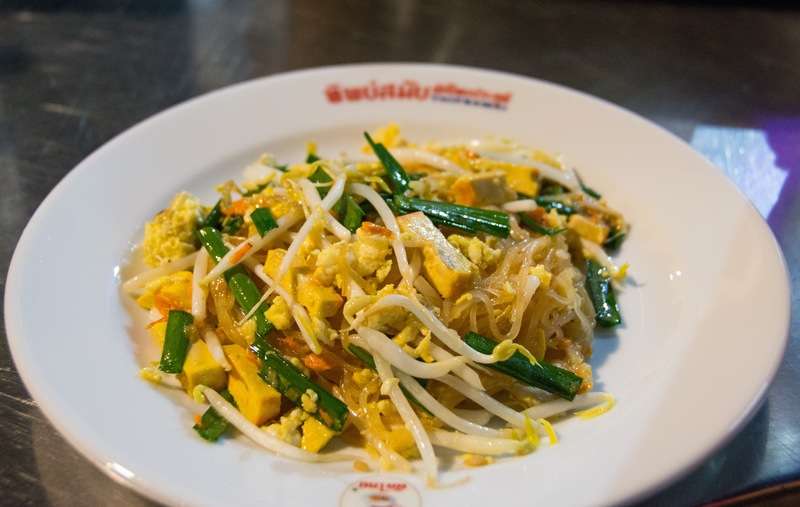 They serve 2 styles of pad thai; one is the original style we are used to and the other is enveloped in a very very thin egg pancake. After trying both, we both liked the original style better. Personally I thought the pad thai was sweeter than what we are used to eating in the States, but this is probably just how it is really served. Locals and tourists alike have been raving about this place and the constant line indicates that they are correct. Here are some photos of a couple of other dishes we tried. Everything really was very good. The tour also took us through the flower market in Bangkok as well, even though it was late at night, they were in full swing packing and preparing their flowers for sale. 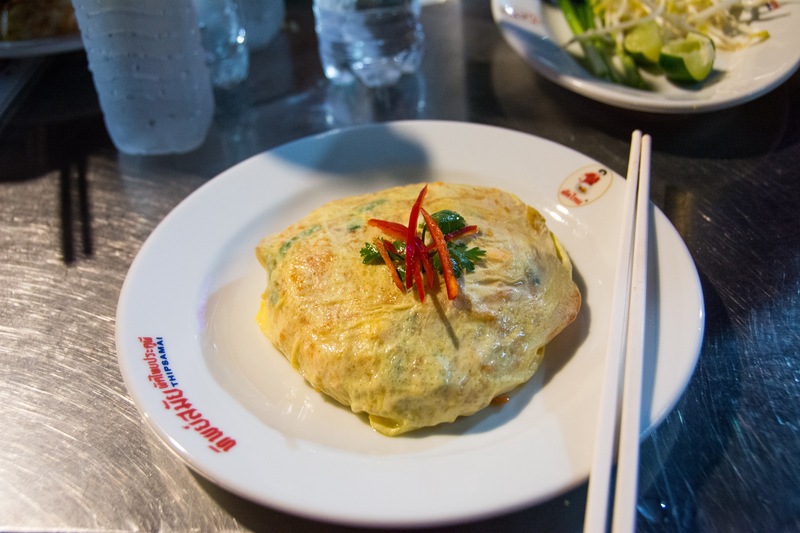 Bangkok Food Tours was professional and very easy to work with. 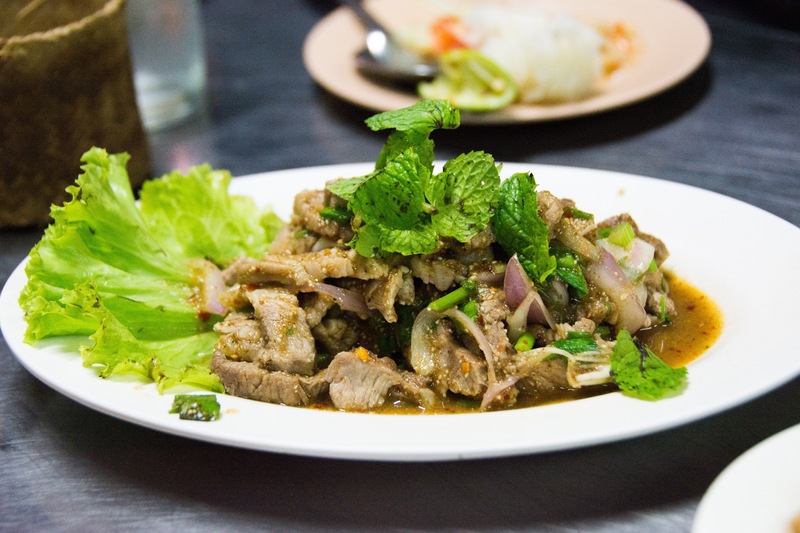 After our experience with them at the food tour, we were super excited for our tour of Ayutthaya that we booked through them.